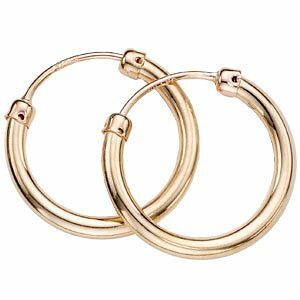 Every girl needs a collection of simple hoop earrings These hoops are 9ct gold and have a diameter of 12mm. 9ct Gold Hoop Earrings is rated 3.0 out of 5 by 7. Rated 5 out of 5 by Anonymous from Great value for money These are just the right size. They arrived on the given date without any issues regarding delivery or product damage. If you’re a person that isn’t the biggest fan of large earrings then these would be perfect for you or a loved one. Rated 1 out of 5 by Anonymous from Poor quality, thin and bendy hoops, rubbish Received these as a present from my 80yo mum this Xmas, had asked her for hinged gold sleepers and thats what she asked the Samuels assistant for. The girl told her they were hinged and that they'd be ideal for me as an adult. Wen she gave them to me I was unable to see the earrings clearly as they were packaged inside a folded clear cover almost completely covered by a white label stating they could be returned only if unopened within 30 days. Mum was adamant they were fine and what I had asked for and that I had to open them, so I did. I immediately noticed they weren't the hinged variety but didn't know how to tell her this so pretended they were fine - as you do. We live In Wales, I don't think H Samuels have branched here so i can't even go and ask for advice in a local branch. The quality is so poor that when I offered them up to my ear they were bending even to try and fit them around the lobe so I didn't bother.